Settlers of Catan (SoC) is a great game. We discovered it last year and have played it regularly since. The standard game is for 4 players, but there is an expansion set that lets you play with 5-6 players (which we bought). 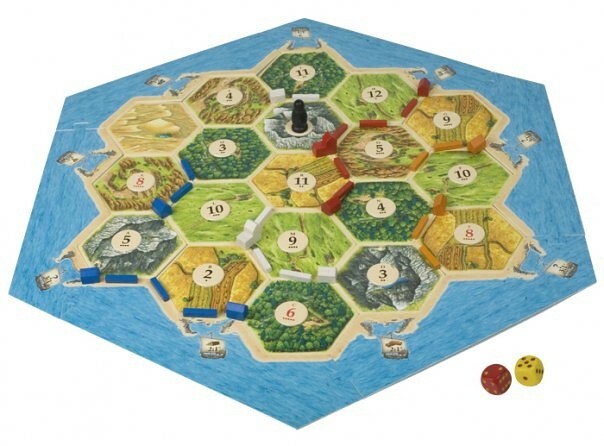 You can find further information about the game at it’s website: http://www.catan.com/. In the picture above, the blue “border” is actually six separate pieces that lock together. The hexes fit inside them. The result is that the “border” holds the hex pieces tightly together. Unfortunately, since these pieces are just heavy cardboard stock, the border pieces work fine at first, but quickly start to warp, the interlocking pieces don’t lock very well, and the borders don’t hold the hexes very well any more. If you can imaging putting this board together by first adding a coaster onto each border piece to hold it flat and still while you add all the hexes, you’ll understand the frustration. Additionally, once the board is set up, if you so much as “touch” the border during gameplay, the entire board is shifted and the hexes get pushed over and under the border and the pieces need to be re-set (and those hexes have little wooden playing pieces strategically placed atop them and those all get jiggled and need to be put back as well).